The Z1 Dashboard software includes a notes screen in it garage display. 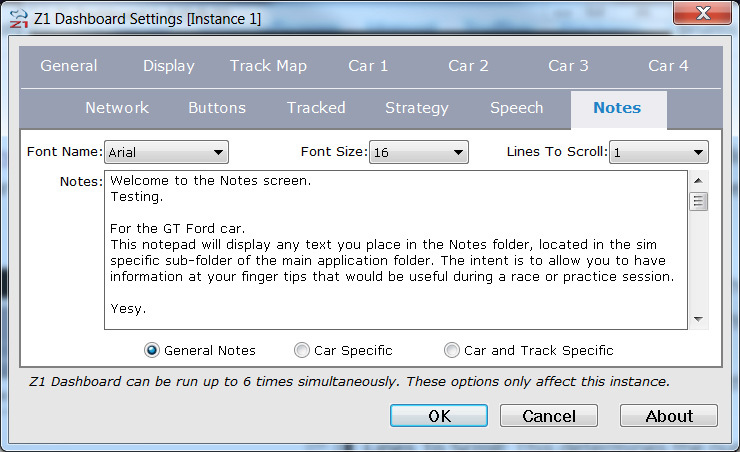 This notes screen allows you to display any notes you deem important, broken down by sim, car or car and track. You can customize the appearance of the note as well as the specific text for that note in this tab of the Settings Dialog. Font Name: This determines the font that will be used when displaying the notes. The drop down displays all fonts available on your system. Select the desired font from the list. Font Size: This determines the size of the font when displaying the notes. Lines To Scroll: This determines the number of lines that will be scrolled up or down when you click the up or down arrows at the top right of the notes screen. Notes: This is the text that will be displayed in the notes area. General Notes: This is the default option. When this option is selected the note will be used as the general notes for the currently selected sim. Car Specific: When this option is selected the note will be display whenever you have the current car loaded, overriding any general sim notes that you may have. Car and Track Specific: When this option is selected the note will be displayed whenever you have the current car and track loaded, overriding any other notes that may be defined.